IHG Rewards Club has launched new Q4 Accelerate-promotion that is valid for stays between September 1 – December 31, 2017. Members have personalized offers based on their recent stay history with the chain. There are various hurdles and members can also earn completion bonus. You can access and sign up for this offer on IHG’s website here. The requirement to stay in any country in North America, Central America, South America, Caribbean, Europe and Greater China is bit of a challenge that I cannot fulfill for sure. I have no plans for Caribbean and Central America for this time period. 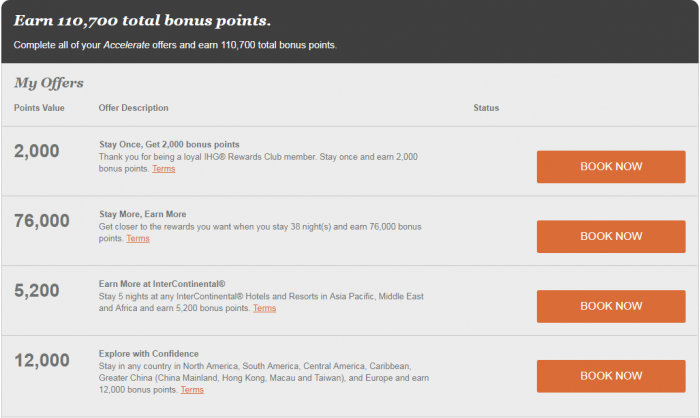 It is certainly interesting to see what kind of personalized offers IHG Rewards Club has been able to come up with this time. Sometimes they are easy while other times basically impossible to complete as was my offer above. Remember to post a screenshot of your offer as a comment below and include rough idea of number of stays you have had over the past 12 months.